JENN-AIR now offers a full suite of beautiful streamlined appliances. General Manager Steve Brown-an architect by trade-brings to the designs European flair and a great sense of clean and appealing design. Kitchen Design Considerations: Ellen Cheever of Ellen Cheever & Associates was a tremendous speaker and source of knowledge. I’d like to share some tips she shared which are essential in today’s kitchen design. -Kitchen planning standards have changed. Start with selecting appliances before you select cabinets. It helps with issues such as clearance rules or installation differences which one wants to be prepared for before specifying cabinetry. -As much as possible, try to select a suite of appliances so to offer clients a cohesive design look. -Two sinks is ideal but if there is not enough room, try to specify a multi-configuration sink. -As much as possible, try to invest in a small under counter ice machine. It makes the best clean ice, at an ideal temperature. -The height of appliances is extremely important. Design with your client in mind. -People are interested in new technologies such as an integrated coffee machine, a steam oven, induction ovens, etc. Induction cooktops have made tremendous progress. In the 80’s and 90’s induction burners used to steal power from each other. Modern induction burners offer a very responsive source of heat and offer the advantage of doubling up as an extra work surface. Today’s induction cooktops are 90% efficient compared to electric (60%) or gas (40 to 50%). JENN-AIR offers an induction cooktop that has a sensor boil option: it boils the water automatically for you and lets you know with a beeping sound when it is ready. The induction cooktop has elements below the burner surface that send electromagnetic forces to heat conducive pots. This allows for a safe cooking surface, as human hands being non-heat conducive, they cannot burn. Middle burners are today’s prime piece of real estate on any cooktop. It’s where the strongest heat source is located. JENN-AIR offers an exclusive 5000 wattage (36000 btu) middle burner. Another fascinating technology was ventilation: This Jenn-Air® luxury telescoping downdraft ventilation offers minimal design and powerful performance right at the cooking surface. The sleek telescoping downdraft vent appears at the touch of a button, and elegantly retracts back into the countertop when not in use. An unexpected refinement in ventilation, each Accolade™ Downdraft Ventilation System is individually crafted and hand-polished. Its graceful movement is matched by its singular performance: It powerfully, quietly, beautifully clears the air, then disappears on command. It’s truly at the forefront of design and performance. JENN-AIR has beautiful ceiling ventilation such as this beauty (offering high clearance, ideal for taller individuals): The average home kitchen releases 1 to 5 gallons of grease per year, hence the importance of ventilation! One should never underestimate the importance of adequate ventilation. Ideally, a ventilation system should be 6 inches wider than your cooktop. it is ok to have it the same width, but some states have different code regulations regarding this matter. I was pleased to hear downdraft vents (vent is on the cooktop and vents downwards) have much improved over the last few years. Steam Oven cooking grabbed my attention and I sure wish my kitchen had room for this 24 inch Steam/Convection oven: This versatile wall oven uses steam to preserve nutrients in vegetables and tenderness in meats, and convection for evenly-baked pastries and roasts. One can use steam and convection together for food that’s tender inside and roasted or crisped outside. The steam/convection oven offers 11 preset food categories in its steam options, 89 presets in all! These can be used manually or automatically. It operates with a water reservoir that needs to be refilled (but never mid cooking). With steam cooking, there is 0% odor transfer between foods being cooked. This means you can easily cook salmon, baked beans and dessert all in one! The outdoor terrace of the Whirpool Facility as seen from the tower. The Obsidian Refrigerator by JENN-AIR: The dual evaporator system creates two distinct and independent climates for enhanced food preservation. Offering LED lighting throughout the interior, the Obsidian minimizes shadows and reflects against the black interior to dramatically display ingredients. Saw it in person: as cool as it sounds! Technologies are constantly evolving and it is so helpful for us to see what is out there. I truly enjoyed my time in Chicago, the kind hospitality of Whirpool and JENN-AIR. I came back with a better understanding of what one needs to consider in today’s kitchen designs. Today I’m sharing a behind the scenes of the designer/client collaboration. Soooo, how does working with us REALLY work? 1/Good designers are not out to exploit you. They care. They have a strong work ethic and they work very hard. 2/Hiring a designer requires a budget, and you can’t hope for a total redesign on a $1,000 budget on designer fees for your living room. That is, simply put, unrealistic. Imagine how many hours it takes you to select one wall color when you go to the paint store! Now multiply that task by 50. Imagine selecting furniture, lighting, rug, at, accessories, wall color, tile, flooring options for a project. Add to that the hours spent meeting on site with you and or the builders, the preparation of powerpoints and budgets, the travel time and the custom selections of fabrics and design of bespoke items, communication with vendors, orchestrating deliveries, creating designs and drawings. Designers easily reach 30 hours + on a room design depending on the scope of the project. Inspiration board section detail by Elza B. Design, Inc. This board helps the client and designer make sure the client is on board with the vision for the project. Each board takes several hours to research and put together. 3/A good designer will be super organized, prepare a contract, and take time to go through important steps of preparation. Tip: Never work without a contract. Extract of a contract from Elza B. Design, Inc.
4/Preparation: Designers need to build the backbone of the design project before you can even start designing. CAD drawings, vision plan, color schemes, measurements, photos. Example of the type of work we prepare at Elza B. Design, Inc before even starting any research or purchasing for our clients. This can take 15 to 20 hours prep work. 5/Trust: Once you select a designer (and we recommend you do your research), please trust they know their craft. 6/Hire someone with excellent client satisfaction reviews, a great portfolio, strong communication and organizational skills. This person should be someone you can relate to and trust to listen well : after all, they are helping you create a space YOU will love. Back in the office, each client has a board with all the items, colors, fabrics, info on hand. Elza B. Design, inc.
8/It may seem scary to entrust us with your home or space, but we will do everything we can to make you happy with the outcome. We wear multiple hats, including overseeing shipping and custom fabrication : we are problem solvers and our goal is to deliver. Custom sketches like these are prepared to communicate with you and the specialists who work with us to ensure a seamless production and installation. Elza B. Design, Inc sketches. 9/Yes, there can be issues but we will solve them! Like when the fabric comes in from the mill at the workroom and it’s defective. We’ll take care of returning it. Or when that glass lamp shade arrives broken. We’ll organize the exchange. Example of resolutions we take care of at Elza B. Design, Inc.
10/If you can trust us, great things will happen, and both parties will enjoy the collaboration. If you hold back, and begin to see us as the enemy, a good partnership cannot flourish. Please express your concerns. But please trust you have hired a professional who will steer you in the right direction. 11/Collaboration is KEY. A good designer will want to communicate. He or She will love it if you can say “I don’t like that because…” “I really like that color but I would prefer…” Your constructive input is needed and appreciated. 12/Please let us know when you are happy. Do send photos of the space to share your excitement when the sofa has been delivered or when the kids are happily enjoying the new family room! We love it when clients share the joy! Makes our day! 13/Budget? Why are we asking about your budget before the contract is signed? It’s very important for a designer to know beforehand if the budget is realistic. Our goal is to meet the client’s wishes: if we know what the budget is, we will know if we are a good fit for you, what solutions to come up with and which stores to shop. 14/Do designers work on weekends? Would you ask your electrician to come during the weekend? Probably not unless it was an absolute emergency. Designers take weekends off like everyone else. I will occasionally do a weekend visit but there is an extra fee for that. Here is an example of how all can be decided prior to any purchase. We are able to show clients what they are buying with the help of new technologies. Board by Elza B. Design, Inc.
15/The big reveal? If you want a custom designed space, please don’t have unrealistic expectations. We simply cannot deliver awhole room redesign in three weeks when a simple sofa takes up to 12 weeks in production! Expect the project to last months. If you want a big reveal, we can have our receiving warehouse inspect and hold all the items, and then deliver and install all the same day with our assistance. There is an extra fee for that, but some clients say it’s worth it! 16/”I want an IKEA priced sofa!” Imagine a dish (we’ll call it A) made with fresh herbs, fresh mushrooms and a homemade tomato sauce. Now imagine the same dish (we’ll call it B) made with dried herbs, canned mushrooms and a jar of inexpensive store bought tomato sauce. Dish A make look as good as dish B, but A is going to be tastier and pricier if you order it at a restaurant than dish B. It goes the same way for furniture. It may look good but the craftsmanship and quality of components is what you pay for. IKEA is a great place to start when you’re out of college or on a budget, but you will find the quality is not as high. Designers know all about quality and where to get it. Ask us. We’re happy and proud to explain how the items are made. I hope you enjoyed this behind the scenes and found it educational! I had the wonderful opportunity to hear Chuck Chewning speak at the Boston Design Center about the complex renovation he supervised for the Gritti Palace. The Gritti Palace Entrance. Photo courtesy the hotel’s website. Hotel Gritti Palace Entrance looking towards the canal. Photo courtesy Gritti Palace. Chewning is a highly talented interior designer from Georgia who majored in Historic Preservation of Architecture and Interior Design at the Savannah College of Art and Design. He is the current creative director of Donghia and director of design at Studio Rubelli. Chewning offered an intelligent, beautifully articulated presentation (and I loved how accessible and down to earth he was) on an enormously complicated renovation of one of the most famous buildings of Venice. US based Save Venice Inc. helped fund the project and the renovation was launched shortly after the palace closed its doors in 2011, after having been flooded no less than 24 times in 2010! Chuck Chewning. Photo courtesy Donghia. The glamorous 16th Century Palace was in dire need of help. Chewning and his team dug 8 feet under the foundation to create concrete basins to capture the water excess and counterweight the foundation. Local artisans were brought in to create historically accurate terrazzo flooring. Marble waiscotting was used on the lower levels to conceal the concrete foundation. The original 91 rooms were reconfigured into 82 grander rooms offering proper bathrooms with modern amenities. Once the building was structully habitable, the designer sifted through all the original furniture and realized only 50% of the original pieces were salvageable! Chewning and his team drew sketches in order to create replicas. Months were spent collecting art and accessories around Europe. My favorite part about the building is that Chewning named the bedrooms in honor of past famous lodgers and worked tirelessly to re-create a bedroom they would have loved. 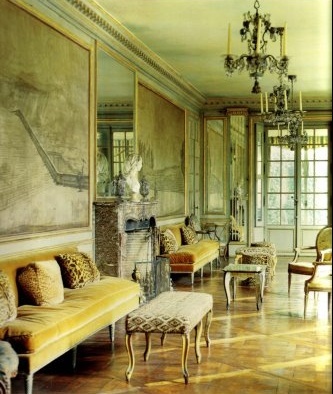 My two favorites are the Peggy Guggenheim Bedroom Suite and the Somerset Maugham Suite. The Peggy Guggenheim Bedroom Suite, named after the famous art collector and her epynomous museum across the Grand Canal. Beautiful 1930’s inspired furniture adorn the space, and the eclectic and highly original details (the cornices!) make for a stunning space. Photo courtesy Gritti Palace. The Peggy Guggenheim Bedroom Suite. Photo courtesy Gritti Palace. Bathroom in The Peggy Guggenheim Suite. Photo courtesy Gritti Palace. English novelist and playwright Somerset Maugham’s Suite. The 81-square-meter suite is adorned in luxurious 18th century inspired fabrics and antique furnishings, interesting curiosity objects and offers a scattering of the author’s novels. Photo courtesy Gritti Palace. The Punta della Dogana Patron Suite. Stucco and Murano glass fans, you are authorized to drool! The Gritti has its own Epicurian School where up to 12 students can learn the art of fine cuisine and then sit down to enjoy their hard work! The Palace opened its doors in 2013 to great acclaim and Chewning is happy to share there have been no floods since the renovations! I recently had the pleasure of discovering an interesting art gallery in Lincoln, MA, The Clark Gallery owned by Dana Salvo and Dawn Southworth (both established artists). Nestled near the railroad tracks in a quaint New England small town, this gallery showcases unique and contemporary art works. A well established gallery (1976), that partners with 1st Dibs and Artsy, Clark regularly renews its exhibits and represents a wide selection of contemporary artists. Another artist on exhibit is actually also one of the gallery owners, Dawn Southworth. Her mixed media works is arresting : composing a multi- layered and finely executed body of work, Dawn is constantly tapping into embroidery, sculpture, drawing, writing, painting, cutting (even burning!) as she works. It’s as if she can’t get enough of any one media, and deliciously indulges herself in as much as she can along the road of the creative process! Looking at art will invigorate your mind, take a break and make sure to check these out, fellow Boston area residents! 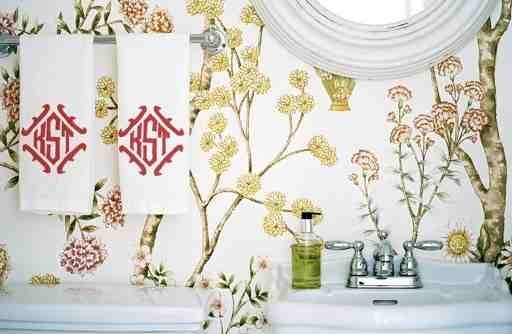 Is it a surprise I should be daydreaming of vibrant and colorful wallpaper prints and florals in bathrooms? Not really. 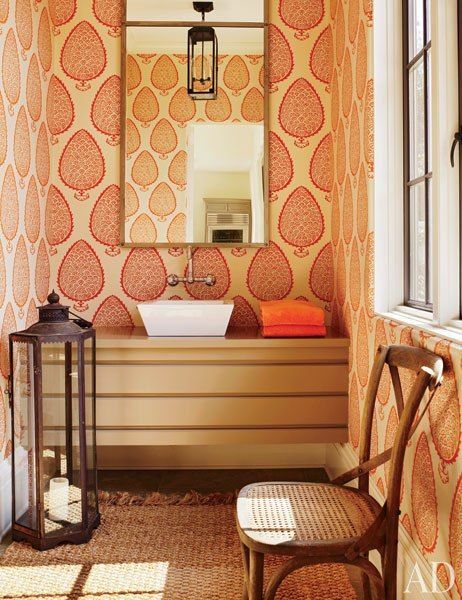 You may all know my secret love for bathroom design by now…if not, refer to some of my past blog posts or my collected images on my Pinterest board. And, it will come as no surprise that, in desperate need of SPRING weather and color (I keep on looking outside my window with sad dog eyes) I want flowers!!! What happened to the weather this year, folks? Seriously, a coat in May??? 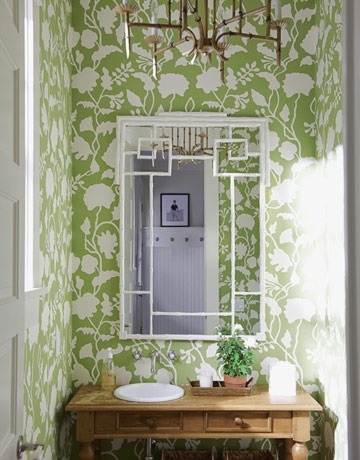 This fabulous and daring print from Osborne & Little used by the talented designer duo Tilton Fenwick created a snappy little powder room. And all the brass fixtures are so in right now! 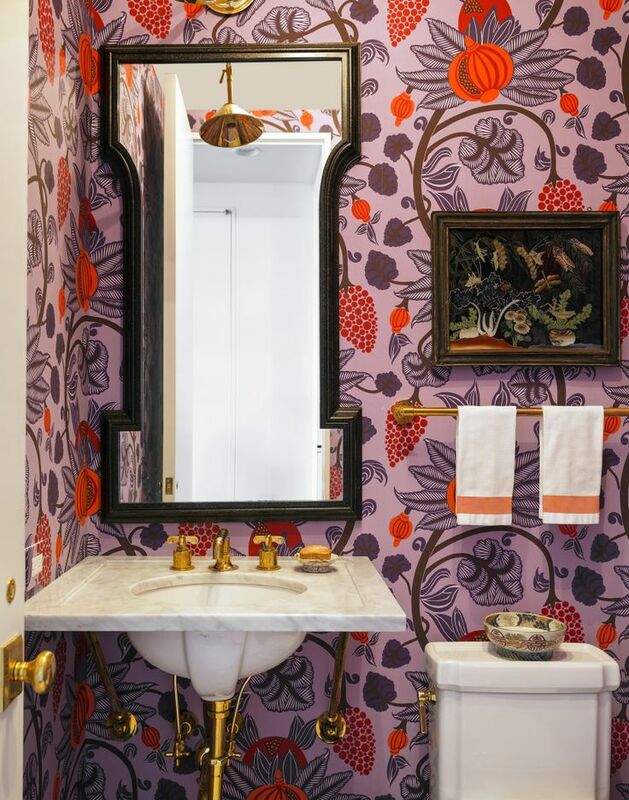 For a recent powder bath project I designed, we decided to go moody and very bold. I also knew wallpaper would make the room. 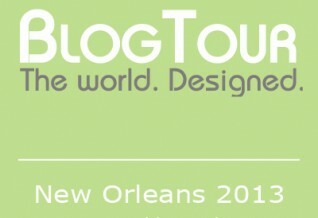 Houzz.com, also known as Houzz : you’ve probably heard about this website by now. But WHAT is it?? And why do I like it? The “Hou” in Houzz is pronounced “How.” Houzz is a combination of the words “House” and “Buzz”. Clients have been finding me on Houzz for a few years and as a designer, I find it to be a fabulous platform. Professionals who are in the home improvement industry can benefit from a beautiful platform to showcase their work and reviews about their work. Houzz’s very friendly interface was dubbed “Facebook for Interiors” by Apartment Therapy in a 2009 article. Time magazine wrote in 2012 :Houzz is “a photo-driven site that’s become the poster-child of the post-recession renovation frenzy”. The platform (which is also available as an APP for your smart phone or I-Pad) allows anyone to sift through articles on specific home improvement questions, search for inspiration or simply shop for home products. Homeowners can also create ideabooks where they can file images of designs or products they like. A lot of my clients have worked with me this way when I first start the collaboration. If they are doing a bathroom remodel for instance, they can save images of bathrooms, tile, lighting they really like and send me the whole ideabook for me to review! An example of a Houzz ideabook (I used one of mine to respect my client’s privacy). Note you can put your own comments under images. Pretty cool, no? My mother is someone very special in my life: a strong and creative woman, a nurturing figure, a source of inspiration and laughter. As long as I can remember, I lived in a creative home. In fact, I learned to sew and draw at a very young age, modeling after my mother’s creative energy. I remember falling asleep to the sound of the sharp blade of a pair of sewing scissors, gliding along confidently on the hardwood floor, as my mom cut large slabs of fabric pinned to patterns to make dresses for us (at midnight!). Fabric was a soothing and happy word in my household. As a little girl, I saw my mother become a Montessori student and then a teacher. I would go to her classroom to help on my days off school, and hold the colorful beads, cherishing the colors and shapes. I would position the pink tower blocks carefully one above the other or arrange the little trays with the small pitcher and cup on their shelves. Our house accumulated oriental rugs my parents shopped for; I remember we could spend a whole weekend driving around the country searching for the perfect antique corner cupboard. My mother would take an antique quilt and repurpose it as a curtain between two rooms, or she would make a patch work art piece for my younger sister’s bedroom, using scraps of fabric. I’d say my passion for interior design and the creative process was inspired, day in and day out, by my mother. Interior Design, after all, is about the loving juxtaposition of items, gathered together to create beauty and comfort. January GLOOM is upon us. When sunshine goes in hiding, do not despair. I recommend fighting it with lots of golds and yellows. 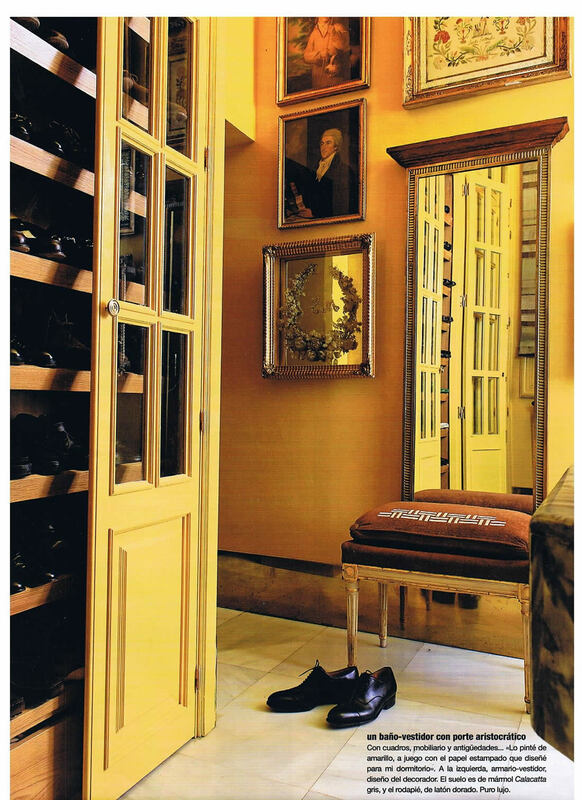 An elegant and classic walk-in closet dressed up with a bang, bathed in pure yellow light, infused in old world style. Lorenzo Castillo. 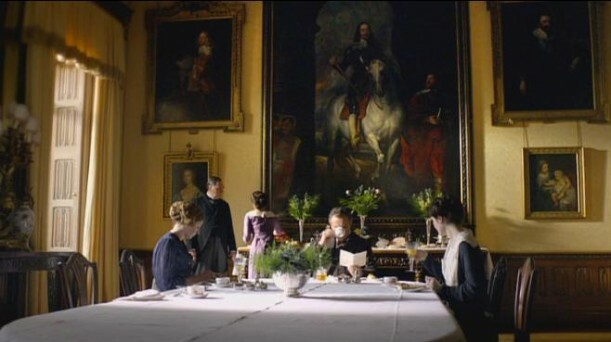 Downton Abby‘s Dining Area. Gloriously sunny and at its best in the morning light. 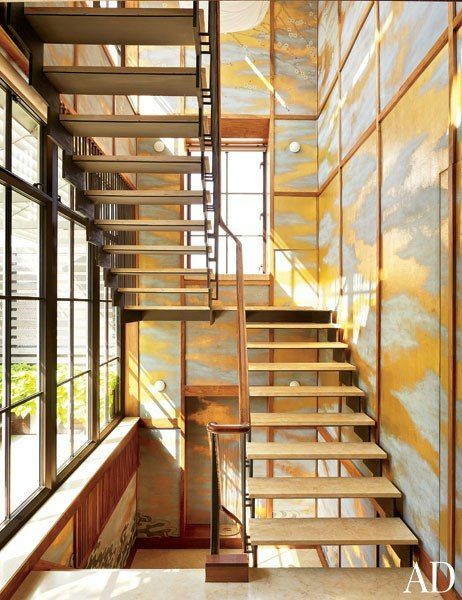 A stunning gold splashed staircase via Architectural Digest. Yes, please!!! My mood is already perking up. Sofa designed by Arne Jacobsen. 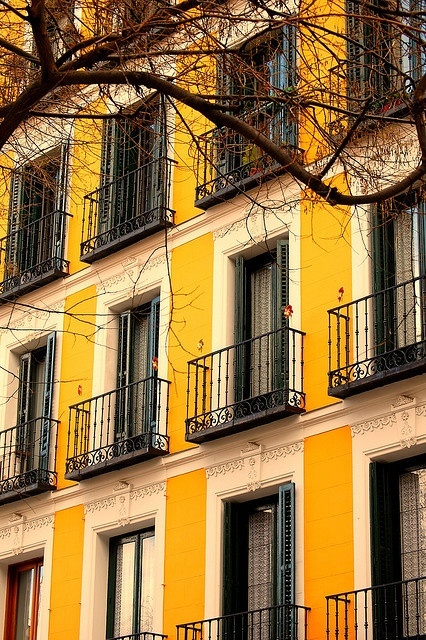 I love how this yellow Madrid building pops out. This spunky and inviting room was featured in Country Living magazine. In the hope I have brightened your day, I bid you farewell until next time. May the force sun be with you! I am documenting here a new bathroom I am designing in its place, an eclectic mix of more organic materials, such as slate tile and weathered wood, with elegant yet low key details. Note how I went from a one sink vanity to a double sink vanity. 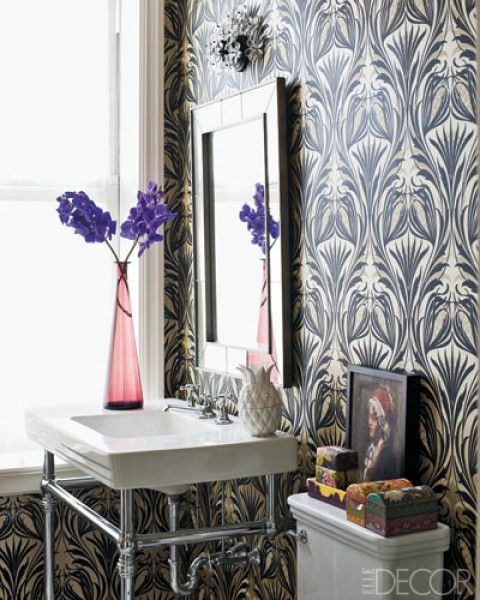 Even in a smaller bathroom, it’s well worth the splurge and actually makes the whole space seem bigger. I used the weathered wood mirrors to blend in with the old farm house character of the house and help tone down the fancy details. One of the only existing luxury hotels in the world with a Frank Lloyd Wright-influenced design, The Arizona Biltmore has been an Arizona landmark since its opening in 1929 when it was crowned “The Jewel of the Desert.” The resort was designed by Albert Chase McArthur, a Harvard graduate, who had studied under Frank Lloyd Wright from 1907 – 1909 in Chicago. Earlier this month, I had the opportunity to stay in the resort for a seminar on Interior Design Business Practices. I was wowed by the distinguished hotel, which is stamped by the unique design touches of Wright and the geometrical fascination he applied to patterns and architecture. Nature is always a central element in his creations, and the building’s openness to the exterior is immediately evident. The resort carries in its walls the quiet and invisible weight of famous past visitors and guests, extending a definite glamorous feel to one’s stay: Marilyn Monroe, Irving Berlin, JFK, Clark Gable, Liza Minnelli, Ronald Reagan are a few of the prestigious visitors who stayed at the Arizona Biltmore. Below, outdoor and indoor views of the resort. Photo credits: Barbara Elza Hirsch. Beautiful gardens and terraces surround the block like concrete pavilions of the Arizona Biltmore. Unusual juxtapositions of glass and concrete, velvet and carpeting enhance the unusual spaces of the Wright-inspired Arizona Biltmore Hotel. Gorgeous chandelier and ceiling detail bring the eye up in this Arizona Biltmore Hotel dining area. I was in Phoenix mostly for work but was able to escape to the Desert Botanical Garden with my designer friend and colleague, Richard Rabel. Cactus glory comes to mind and I was truly awed by the landscapes and local plants and fauna. I had never been out West so this was really a treat! The Chihuly exhibit was being installed while we were there so I was able to catch a few interesting exhibits in the making, with stunning glass sculptures arranged next to grandiose plants. Hope you enjoyed this slice of design and sun from Arizona!